Middle school students LOVE writing template poetry. The beauty of using the template is that when they try it, even the kids who don't usually care for poetry writing can find their inner Robert Frost. The confines of the template focuses them. Its simplicity enables them to easily get their initial ideas down, making the whole experience less daunting. And once the kids have finished their first draft, I always remind them that this is their poem. They can alter the template in any way they see fit when they revise. 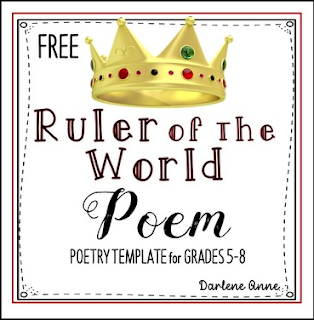 Thank you for checking out this poetry writing activity!